Terry Sloane was born in the 1910s, a child prodigy from early youth. As a young boy he demonstrated superb skills in athletics, martial arts and engineering skills. He entered college at the age of 12 and graduated in less than a year. Having obtained the maximum formal education available to him, he devoted himself to athletics, again showing superb performance. He later turned his acumen to business, where he rapidly became successful and wealthy. These accomplishments, while considerable, were empty to Sloane, and left him feeling unchallenged and depressed. He resolved to end his life, rather than continue the "perfect" existence. As he was driving home from work, he noticed a young woman standing on the edge of a bridge. Before his eyes, she jumped into the river. Acting quickly, Sloane saved the woman from drowning and learned her tale. She identified herself as Wanda Wilson, a local girl whose younger brother had fallen in with a gang led by a petty criminal called the Big Shot. Sloane adopted the identity of Mister Terrific and found renewed purpose in defeating the petty thug. Sloane then took upon himself to set up an alternative to juvenile delinquency in the "Fair Play Club," an institution that provided urban kids a place to exercise and find shelter from detrimental influences present in Depression-era America (Sensation Comics vol. 1 #1). As Terry Sloane, Mister Terrific hired Wanda Wilson as his personal assistant; he later became romantically involved with her. Sloane remained active as Mister Terrific throughout the war years, focusing mainly on minor criminal elements in his native city. In a case as yet unrevealed, Mister Terrific achieved national prominence in when he became reserve member of the JSA in the early to mid 1940's. In 1945 when he joined the Justice Society of America in two cases, one that illustrated the importance of Germany's defeat to a World War II-era pacifist (All-Star Comics vol. 1 #24). The JSA recognized Sloane's talents (1,000 of them, no less) and he was later awarded full membership at some point. Mister Terrific retired from active duty as a costumed adventurer sometime prior to the disbanding of the JSA in 1951. His subsequent activities, particularly the fate of girlfriend Wanda Wilson, are unknown. When the Justice Society resumed active meetings in the early 1960s, Mister Terrific emerged from retirement. His activity was infrequent, appearing only with a few cases, notably those with the Justice League of America (Justice League of America #37-38, 55-56). Sometime in the early 1970s. Mister Terrific again retired to devote his energy to his life as a philanthropist and educator. He appeared briefly in the late 1970s when he was captured by the Wizard's Secret Society of Super-Villains (unpublished Secret Society of Super-Villains #16). Prior Earth/Earth-0 = The history of Mr. Terrific on Prior Earth-0 is thought to be largely similar to that of the original Earth-2 version, up to his death at the hands of the Spirit King on the Justice League satellite in the late 1970's. The primary differences would be interactions with Golden Age versions of Superman, Batman and other characters who did not exist in the Earth-0 timeline as they had in that of Earth-2. He is revealed to have a degenerate brother Ned, who is the grandfather of the villainess know as Roulette. Whether these relationship exist on the original Earth-2 is not known. In this timeline, the final accounting of Mr. Terrific's murder was revealed. After returning to Earth-2, the JSA tracked the Spirit King, revealed to have become a pawn of Shaitan to Stonehenge while he was still in the in Flash's body. In the ensuing battle, The Spirit King assumed control of Doctor Fate and allowed the Flash to lure the Spectre to him. As Shaitan and Romaine held the Spectre at bay, the recently-deceased Sloane intervened and disrupted the connection between Romaine and Shaitan, casting the Spirit King into the depths of Hell. Mister Terrific had few seconds of corporeal existence to bid farewell to his JSA comrades and then went to his afterlife reward (The Spectre vol. 3. #54). Whether this version of events occurred on the original Earth-2 has not been revealed. In the mid-1990s, The Spectre happened up a young man named Michael Holt considering suicide after a series of personal reversals. To inspire the man not to give up on life, the Spectre recounted the life story of Terry Sloane and his life as a costumed in adventure. Holt not only decided to live, he took up the mantle of Mr. Terrific himself (The Spectre vol.3 #54). He ultimately became a member of a re-formed Justice Society and served in that role until the history of Prior Earth 0 was erased in the Flash point event. Current Earth 0 = Currently no character with the name Terry Sloan has emerged. The Michael Holt version of Mr. Terrific exists independently of the traditional legend of Mr. Terrific. Earth-21 = The Mr. Terrific of Earth-21 had by all accounts an essentially identical early history to his Earth-2 counterpart. In 1951, he retired along with the rest of the JSA at the bidding of the HUAC. The HUAC took a much harder line than in other timelines, persecuting non-conformists who refused to give up the vigilante lifestyle. Mr. Terrific is presumed to have cooperated and remained retired, though this has not been verified. (DC: The New Frontier LS). Earth-22 = The history of Mr. Terrific up until the late 1940's on Earth-22 is largely identical to the history on Earth-0. He retired at the end of World War II and expanded his industrial holdings, though reporter John Chambers (Johnny Quick) questioned the scruples employed. He was present at the cataclysmic battle in DC against Dyna-Man and the Ultra-Humanite and is not a known casualty (The Golden Age LS).. Years later, an unrelated person besmirched the legacy of Mr. Terrific by becoming Mr. Terrific II, an otherwise untalented but heavily armed individual with little understanding of "Fair Play". (Kingdom Come LS). Earth-40 = The Terry Sloan is a former field agent for military intelligence on vacation with his fianc�e in Switzerland when she is killed in a struggle with The Scarecrow, a Nazi "cleaner". Sloan adopts the identity of "Mr. Terrific" and joins Batman's team grudgingly. When the war ends, Sloane abandons the costumed life and begins running a series of companies, including a pharmaceutical firm study the powers of Superman. When Superman is revealed to be the rogue Kryptonian Zod, Sloane perfects a formula to allow Batman to defeat Zod in hand to hand combat. He later reforms the group with Batman at Mr. Terrific. His ultimate fate is unknown. (JSA: The Liberty Files LS I and II). 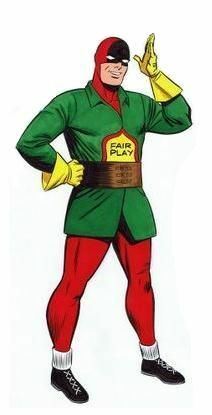 A child prodigy that demonstrated extreme intelligence and physical skill at an early age, Mister Terrific fashioned himself as a champion of justice and fair play. He honed his body and martial skills to champion levels and relied upon these exclusively. Like many of his fellow JSAers, Mister Terrific was only mortal and could be (and was) slain as such.